Well, as promised we watched Dr Who at the weekend and it was a goodie! 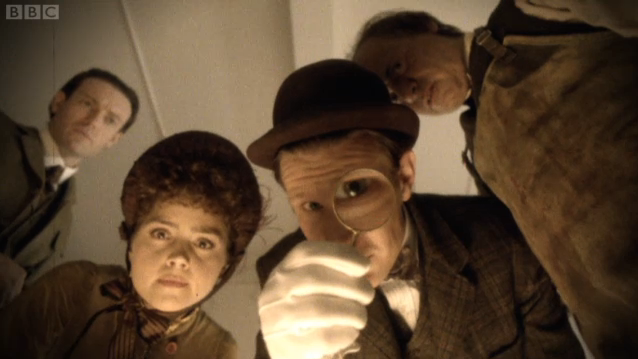 Bright red corpses,1 prehistoric leeches, and the Doctor in a kind of Victorian onesie. I even enjoyed the slightly awful ‘Thomas Thomas’ joke, which probably tells you quite a lot about the kind of cheesy humour we’ll put up with (i.e. fervently embrace) here at GBO&D. Other best bits? Use of the phrase “There’s trouble at t’mill” and a pathologist apparently composed by Gatiss in full League of Gentlemen vein. On the subject of that surgeon (and in the interests of offering a slightly more reflective perspective on the episode than simply “Dr Who! It’s awesome!”, as accurate as that is): I was interested in how the episode played around with notions of vision and sight. After all, the last time I found myself watching a late-Victorian pathologist was in Ripper Street, the BBC’s neo-Victorian procedural crime drama; a programme which (as I discussed in an article for JVC Online) is as preoccupied as its genre demands with the technologies through which we observe and record the body. ‘The Crimson Horror’ didn’t take its exploration quite as far (Dr Who is a different kind of show) but we did see the Doctor and Clara getting down and dirty with a magnifying glass, something that always makes me prick up my, erm, eyes. Shades of Sherlock Holmes… again? The Doctor indeed goes a bit Homer Jackson (that’s a Ripper Street reference, guys, keep up), breaking out the chemistry set to analyse the origin of the mysterious ‘Crimson Horror’; and it’s no surprise that the ‘Great Detective’ Madame Vastra (according to the Whoniverse, the model for Sherlock Holmes) also plays a crucial part in diagnosing the problem.2 Both incidents could be read as reinforcing the link between medicine and detection assumed by the modern procedural (with its links to the autopsy suite) and – as suggested by Heather Worthington in The Rise of the Detective in Early Victorian Popular Fiction – perhaps as well-established as detective literature itself. As in Ripper Street, the newly-invented camera also plays an important role, capturing the ‘optographic’ image of the Doctor that leads Jenny and Madame Vastra to his aid. Most interesting, however, is Ada (Rachel Stirling), the brutally disabled daughter of maleficent Mrs Gillyflower (Diana Rigg). Intent on building a ‘new Jerusalem’ peopled by ‘supermodels’ of eugenic perfection,3 Mrs Gillyflower considers her daughter eminently disposable: ‘there is no room,’ she tells Ada, ‘for people like you’. At the same time, Ada is repeatedly exploited in recruiting more candidates for the mill’s human factory. We first see her revealed by the drop of a curtain, reduced to an effect in her mother’s campaigning sermons; a living exemplar of the dangers of demon drink. Her late father, Mrs Gillyflower attests, blinded his child in a fit of drunken rage. Of course, as the Doctor rapidly discerns, the story is entirely false. Ada’s condition is a consequence of her mother’s megalomania; she has blinded her daughter in the course of her experiments. It is ultimately her recognition of this cruelty that liberates Ada. First attacking her mother and then destroying Mr Sweet, she is able to move beyond her disability and recognise her potential: in Ada’s own words (and her mother’s religious vocabulary) leaving the darkness and re-emerging into light. As visually referenced in the poisoned Doctor’s lurching gait, there’s an element of Frankenstein about Ada’s narrative: the rejected product of a single-minded scientist, she resembles her creator more than either might like to admit. (Mrs Gillyflower’s last words are “That’s my girl.”) It is no wonder she empathises with the disfigured Doctor – “my monster” – another Frankensteinean echo. But for me – unsurprisingly, given the topic of my research – the story was also strongly reminiscent of early Victorian penny fiction. 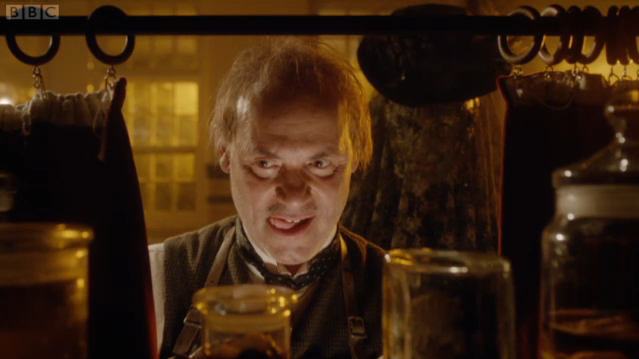 The frequently-fainting Mr Thursday might have “no interest in the deplorable excesses of the penny dreadfuls”, but Mark Gatiss certainly does, describing the episode to the Radio Times as ‘a lurid, Victorian penny-dreadful’. 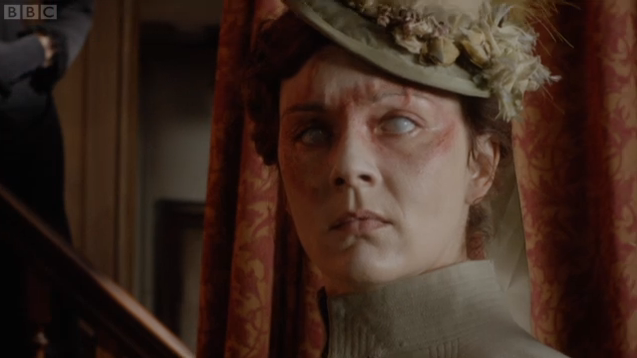 Seen in this light, Ada’s blinding is one of the episode’s most appropriate inclusions. Although Mrs Gillyflower has blinded Ada accidentally, her decision to exhibit her daughter in the service of her cause links her in to a tradition of macabre apocrypha concerning the behaviour of the indigent poor. Popular particularly in the early Victorian period, a sensational variety of ‘urban expose’ regularly included details of the lengths to which beggars might go to maximise their profit and minimise the labour otherwise necessary to procure an honest wage. Scenes set in low-class drinking dens, with apparent cripples throwing off their crutches, ‘blind men’ removing their eyepatches and ‘impoverished widows’ relieving themselves of the children they have borrowed for the day, sit alongside still more violent and disturbing accounts of the strategems adopted by the “skivers” of the day (to borrow a term of the current coalition). The early pages of G.W.M. Reynolds’s The Mysteries of London provide one such gruesome example, particularly apposite in the context of this episode’s antics. “But how?” said Bill impatiently. “What the devil are you driving at?” demanded the man. “And how is that?” asked the man. “By putting her eyes out,” returned the woman. Her husband was a robber – yes, and a murderer: but he started when this proposal met his ear. “And how did she do it?” asked the man, lighting his pipe, but not glancing towards his wife; for although her words had made a deep impression upon him, he was yet struggling with the remnant of a parental feeling, which remained in his heart in spite of himself. “And you’re serious, are you?” demanded the man. “Why not indeed?” echoed Bill, who approved of the horrible scheme, but shuddered at the cruelty of it, villain as he was. 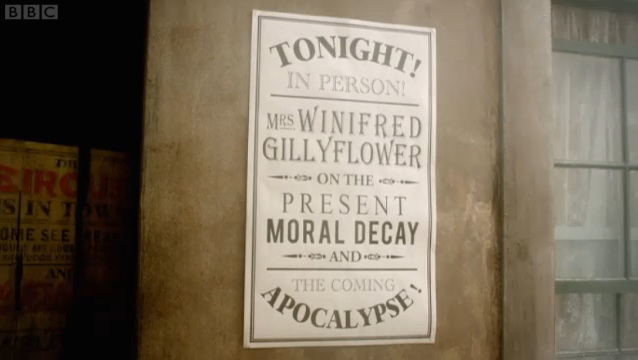 The woman in Reynolds’s serial dies at the hand of her drunken husband (just as the sermonising Gillyflower might predict), but her intention is quite as malevolently enterprising as anything Gatiss’s heroine devises. More threatening and more macabre than the unexpectedly winsome Mr Sweet, the eye-devouring beetles represent the same brutal callousness towards one’s children and the same preoccupation with one’s own, selfish advantage. Unsurprisingly for a series at least nominally aimed at children, the parent-child relationship is at the heart of Doctor Who: parental love is frequently deployed as a narrative solution and the parent willing to hurt or abandon their child therefore provides one of the show’s most terrible imaginative possibilities. Just as in the Mysteries’ melodramatic narrative, it is this final evidence of Mrs Gillyflower’s cruelty that makes her eventual demise acceptable: we cheer as she crunches (with all the violence of Javert) onto the factory’s hard stone floor. Drawing on the same preoccupations with vision, display, light and darkness that underpin the penny novels he cites as his inspiration, Gatiss creates an episode that fits perfectly into the prevailing ethos of the series while maintaining an accuracy to his source material that could almost be missed amongst the leather suits and lizard women. In summary: Dr Who! It’s awesome! Just as an aside, it’s probably just because I’m currently about a third of the way through Hide and Seek (full report to come) (spoiler: it’s extremely silly) but I felt like there was almost a whole other blog post to write on the correspondences between this episode and Wilkie Collins’s 1872 novel Poor Miss Finch. There probably aren’t realistically that many, but it is a novel about blindness, with a blue man instead of red ones – and certainly Ada would fit nicely into Collins’s narrative landscape of powerful women and almost fetishised disability. Maybe a topic for another day.